The inspiration for 14 Hands wines recalls a time when wild mustangs once freely roamed the hills of eastern Washington State. These small horses, measuring a scant fourteen hands high – a "hand" being equivalent to a man's palm width, approximately four inches – would travel down from the hills every day to drink from the Columbia River and graze along the riverbank and then retreat back to the hills at night. Strong and tenacious, these little horses became known for their endurance and wild spirit. This unique and beautiful landscape gave these unbridled horses their spirit and tenacity that now feeds our vines. With loamy–sand and gravel soils, these hills require a strong and determined grapevine resulting in big, bold, juicy red wines and crisp, fruit-forward white wines. Now you can experience the spirit of 14 Hands in person, as well as in the bottle, by visiting our brand new winery and tasting room. 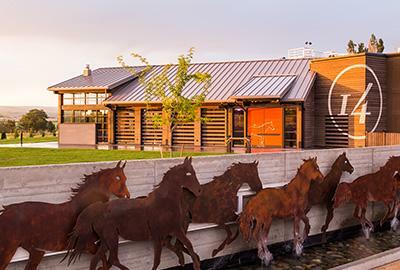 Designed to highlight the unique history of Washington wines and the Horse Heaven Hills, this beautiful new facility features fantastic indoor and outdoor seating areas, a beautiful tasting bar, and a unique barrel room. The new space showcases an expanded collection of 14 Hands "The Reserve" wines, as well as seasonal offerings throughout the year. Come join us in the tasting room or check out our calendar of events – we can't wait to see you!